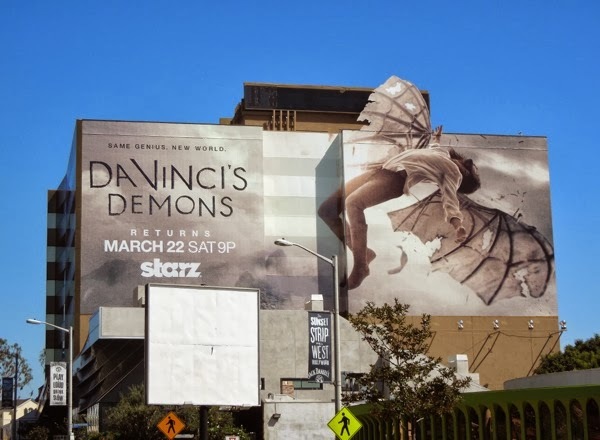 From the looks of these giant-sized billboards for Starz period drama, Da Vinci's Demons, it's time for 'Leonardo da Vinci' to spread his wings in the series sophomore season. 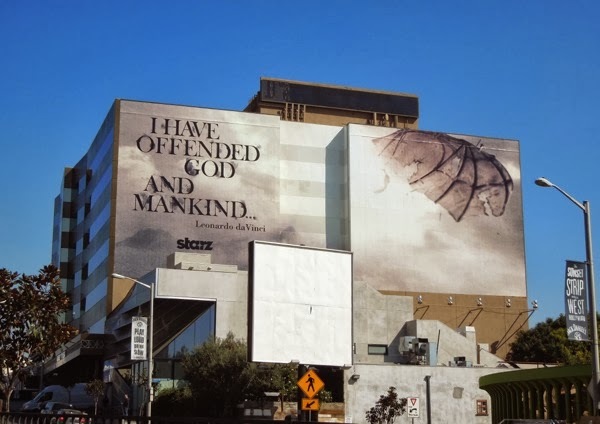 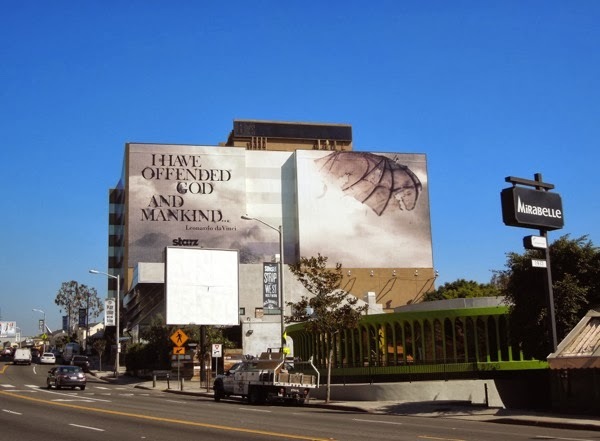 He may have 'offended god and mankind' but these ad creatives look spectacular along L.A.'s Sunset Strip and more than make up for any indiscretion, especially with the special wing embellishment that followed the teaser billboard. 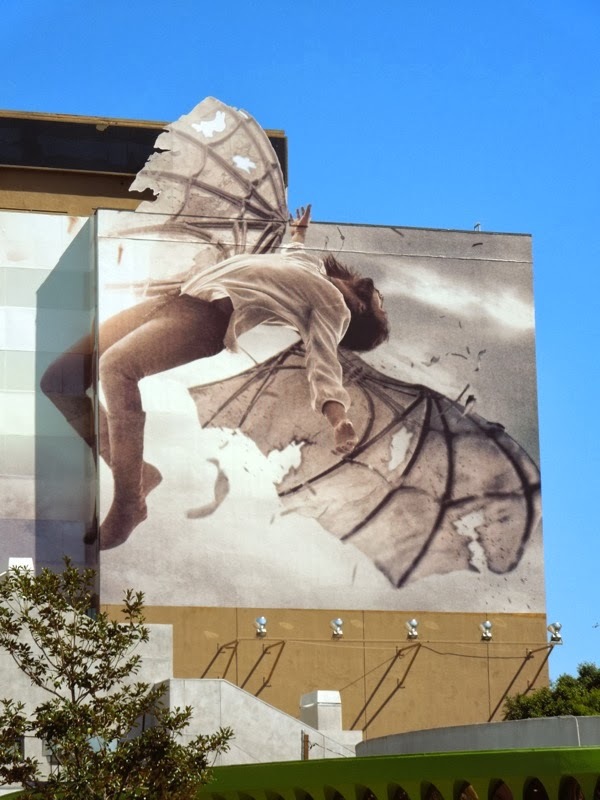 The Italian Renaissance Man certainly looks like a flawed fallen angel in this second phase creative and his winged invention makes for an arresting visual to capture passersby imagination. 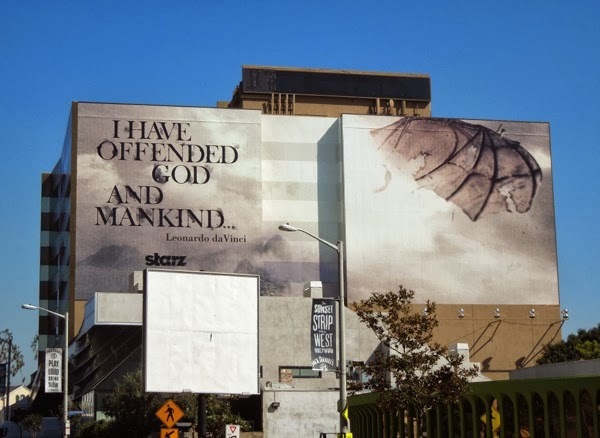 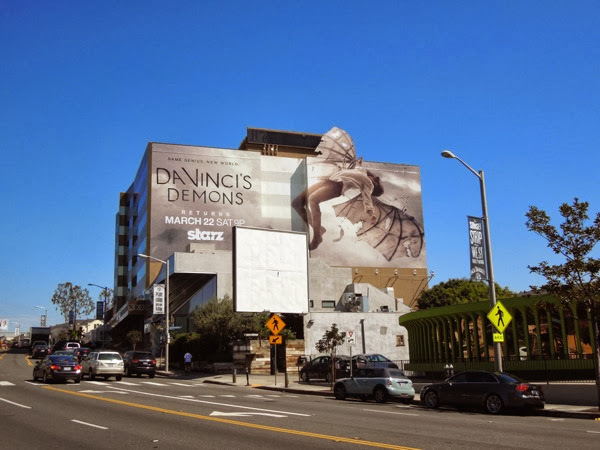 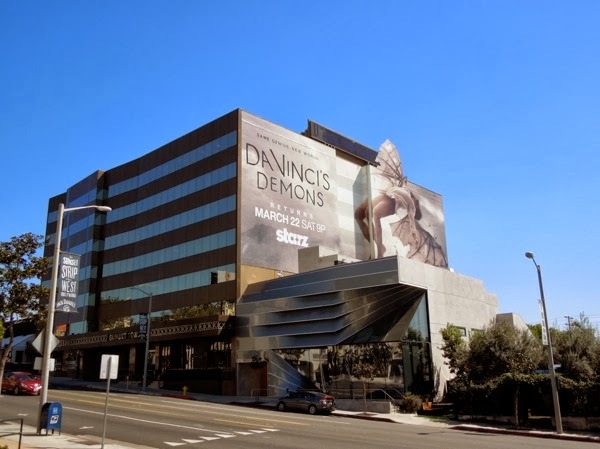 The phase one teaser billboard for the second season of Da Vinci's Demons, which was intriguing in its own right with that quote, was spotted along Sunset Boulevard on February 24, whilst the winged special extension version was snapped on March 12, 2014. 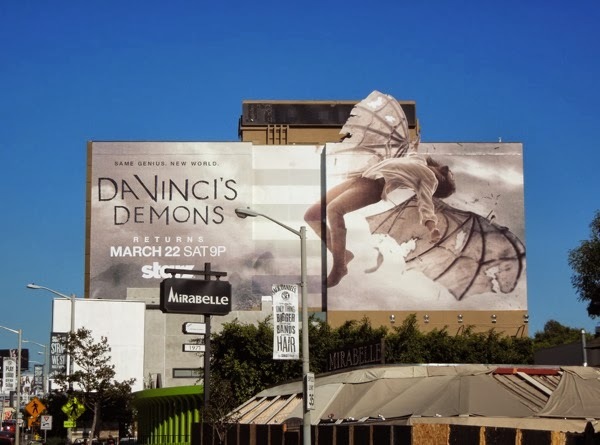 As you can see the version with Tom Riley soaring through the skies really catches your eye from a distance along the Strip and it's the first time Daily Billboard has ever seen a special extension installation in this super-sized ad location. 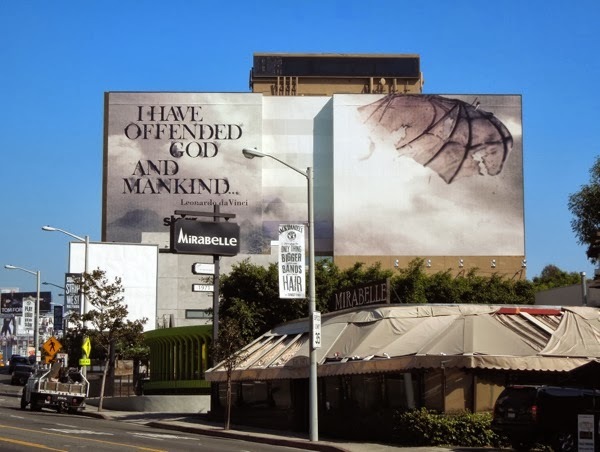 In fact, it wasn't that long ago that this Sunset Towers wallscape was treated as two separate ad units, as these examples for these Havaianas flip-flop billboards and these Batman Arkham City video game billboards illustrate. 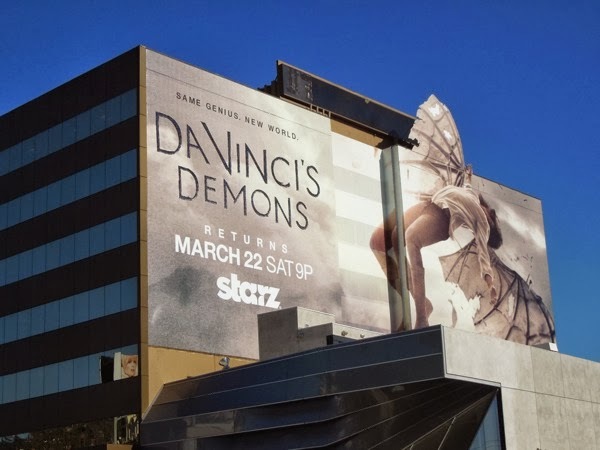 If you're a fan of the show, be sure to also check out this giant Da Vinci's Demons season one billboard from March 2013, which also had a winged theme. 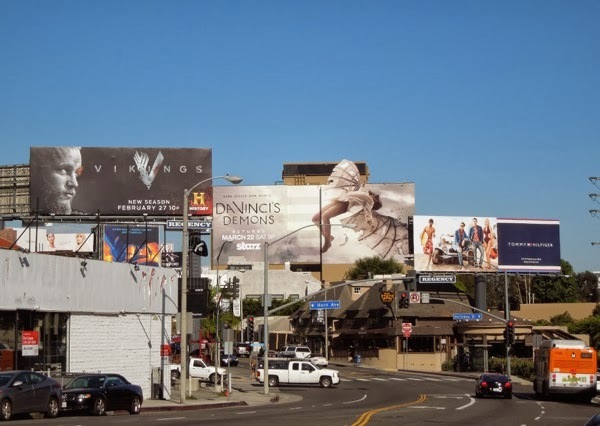 This season will see the genius inventor Leonardo da Vinci take flight to far off lands and make new enemies and allies, so it's no wonder this key art evokes 'Icarus' from Greek Mythology falling from the sky on his manufactured wings after ignoring warnings of flying too close to the sun. 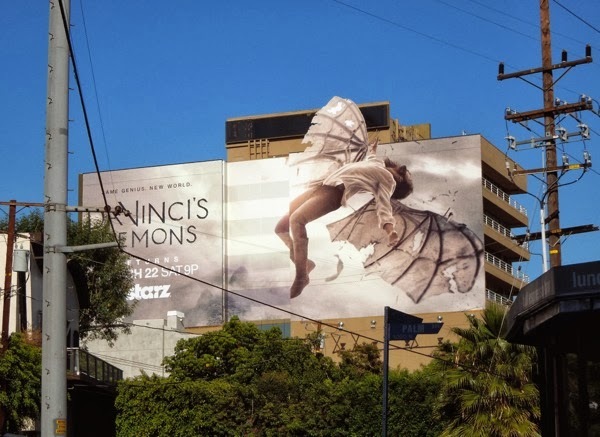 Meanwhile in modern times, this special installation creative will surely go down in history as a fantastic example of out-of-home innovation and ingenuity. 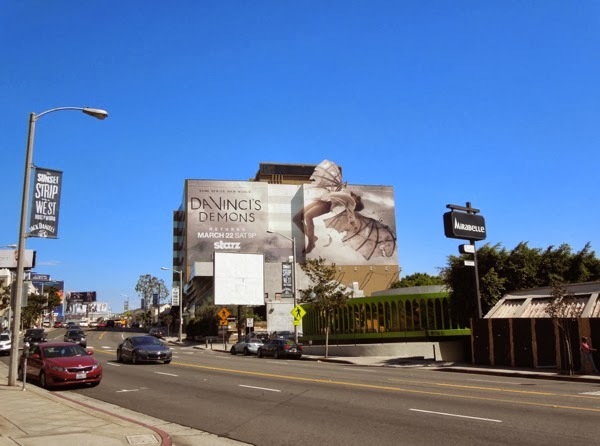 Leonardo's wings may have been an epic fail, but this billboard is a true eye-catching winner. 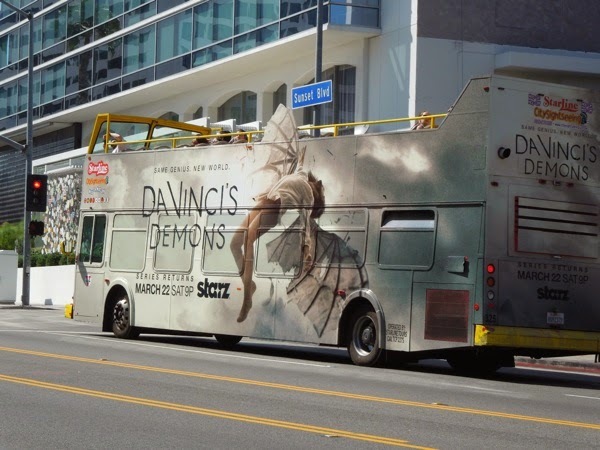 UPDATED: Daily Billboard also spied this bus advert for the second season of the show, which also has the special wing extension, making it stand out even more as it drives along the Sunset Strip on March 13, 2014.